When it comes to changing their passwords, bacteria are just as bad as you and me — maybe even worse. A Carnegie Mellon University research team has found that despite 2.7 billion years of evolution, bacteria are still using the same "password" to initiate the process for making spores. Their findings were published in the September issue of PLOS Genetics. The Carnegie Mellon researchers, led by the Department of Biological Sciences' Dannie Durand, used computational and experimental techniques to study how the signaling network that causes Bacilli and Clostridia to form spores has evolved since the two bacteria diverged from a common ancestor 2.7 billion years ago. Bacteria make spores when times are tough. A protective shell forms around dormant cells to let them withstand harsh conditions like heat, acidity and radiation. Understanding sporulation has implications for many fields, including health care. For example, the spores of C. difficile can survive hand sanitizer, making that bacterium the leading cause of hospital-acquired infections. Bacteria use "plug-and-play" signaling networks to sense and respond to environmental challenges. A sensor protein recognizes an environmental signal and passes a message to an activator protein, which turns on the appropriate response. Each sensor-activator pair has a specific set of amino acids that act like a password, which ensures that the sensor passes the message to the correct activator. In the case of the sporulation network, a sensor protein recognizes environmental threats and alerts an activator protein that controls sporulation. The plug-and-play nature of signaling networks makes it easy for bacteria to adapt in a constantly changing world by integrating new sensors into the sporulation network. A sensor that recognizes a new challenge can turn on sporulation, as long as it has the password for the sporulation activator. Prior studies have shown that in certain well-studied species of Bacillus and Clostridium, the proteins that activate sporulation are very similar, but the signaling networks that deliver the message are not. In Clostridium acetobutylicum, the sporulation signaling network consists of two proteins: the sensor and the activator. In Bacillus subtilis, the network consists of four proteins: the message passes from the sensor through two intermediate proteins before reaching the activator. This raised the question — how did evolution produce different networks that achieve the same results? It was thought that the common ancestor had the simple two-protein network. 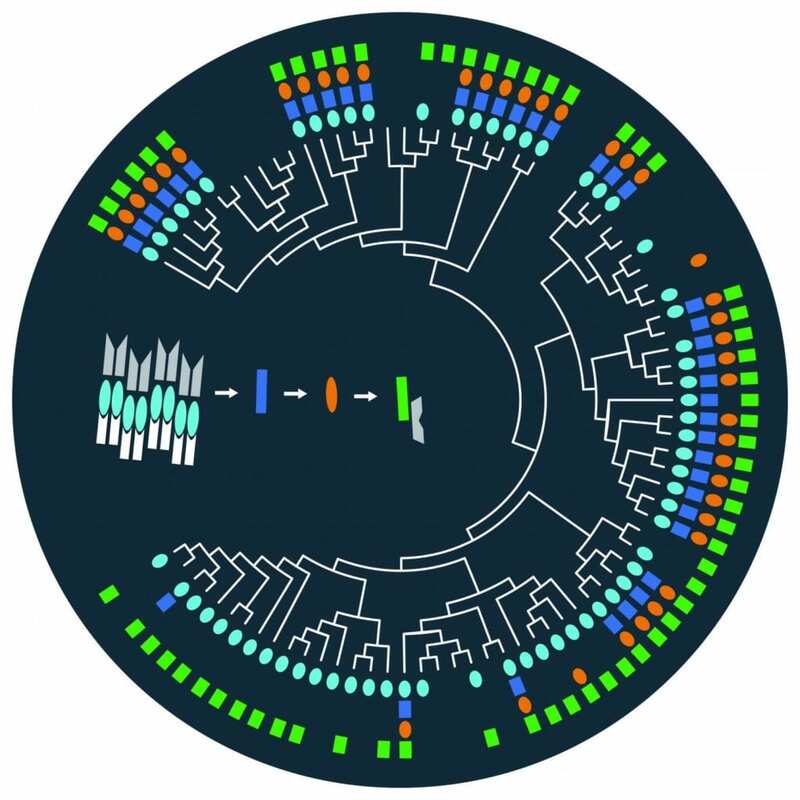 Researchers hypothesized that the Bacillar sporulation network gained two proteins over the course of evolution, resulting in the four-protein version we see in Bacilli today. The Clostridia continued to use the two-protein network. This hypothesis was hard to test using standard sequence comparison methods, which are unable to distinguish one signaling network from another. Durand and colleagues overcame this obstacle by developing a targeted computational approach that combined sequence similarity, protein domain content and neighboring genes to find the genes involved in the sporulation signaling network. When they applied this approach to 28 Bacillar genomes and 56 Clostridial genomes, they found genes encoding four sporulation network proteins in the Bacilli, as expected. Surprisingly, they also found all four genes in many Clostridial genomes. This overturned the prevailing theory, revealing that the common ancestor must have had the four-protein network. This means that over time some of the Clostridia evolved to use the simpler two-protein network. "It was surprising, because traditionally we think about evolution going from simple to complex," said Durand. "But there are more and more examples of evolution going in the other direction, from complex to simple." To better understand these changes, study co-author Philip Davidson built artificial four-protein networks in test tubes, each with different combinations of the proteins found in the four-protein sporulation networks. He was able to replace any protein in a Bacillar four-protein sporulation network with the corresponding protein from a Clostridial four-protein network, and vice versa, and the activator still got the message. This shows that Clostridia and Bacilli are still using the same passwords as their ancestor that lived 2.7 billion years ago. "It's like your home wireless network. When you first got it, you set up a password and put it in all of your wireless devices. Over the years, you got new computers and smart phones, or had visitors who needed to use the wireless network. If you changed the password, the old devices wouldn't work, which would be a hassle. So, you continue to use the old password to ensure that everyone could still access the system," Durand said. "Philip's experiments show that the Clostridia and the Bacilli get stuck in the same rut when it comes to changing passwords as we do." Additional study authors include: Rory Eutsey, Brendan Redler and N. Luisa Hiller, Carnegie Mellon Department of Biological Sciences; and Michael T. Laub, Department of Biology, Massachusetts Institute of Technology. The study was funded by the Human Frontiers Science Program and National Science Foundation (DBI-1262593). Any opinions, findings and conclusions or recommendations expressed in this material are those of the author(s) and do not necessarily reflect the views of the National Science Foundation. Laub is an investigator of the Howard Hughes Medical Institute.